Voters in the Caucasus country of Georgia—a U.S. strategic partner and poster child of post-Soviet reform—will go to the polls Monday to elect a new parliament. The election has been a heated one, with escalating charges and countercharges of criminality and political abuse. The Georgian government, led by President Mikheil Saakashvili and his United National Movement, says it has spent the past nine years seeking to break free of the shackles of post-Soviet semiauthoritarian kleptocracy and usher in a thriving modern and Westernizing state. The United National Movement’s only serious opponent in this election is the Georgian Dream coalition, spearheaded by Bidzina Ivanishvili, a tycoon who made his fortune in post-Soviet Russia. The Georgian Dream insists that the United National Movement’s accomplishments and aspirations are nothing but hot air, a sentiment buttressed last week by the release of videos implying the systematic abuse of prison inmates, which has damaged the government’s “modernization” trope. The political stakes are much higher than usual. Russia is not a leading stakeholder in the race. The electoral process has been unfair overall. Thanks to the prison abuse scandal, however, the process has now become highly competitive. All stakeholders must now focus on defending the integrity of the vote, including the complaints and appeals process, while vociferously rejecting the politics of retribution and destabilization that has become more pronounced as election day nears. Let’s explore each of these points in greater detail below. The stakes in this parliamentary election are higher than in any previous Georgian election, with the possible exception of Georgia’s first free elections in 1990, a year before the Soviet Union collapsed. As in most post-Soviet states, political power in Georgia resides in an executive branch headed by a powerful president. Georgia has had a prime minister since 2004, but the president directly appoints him or her. Thanks to a 2010 constitutional reform, however, Georgia is now shifting toward a more parliamentary system of governance. After a transition period that will extend through the 2013 presidential election, parliament will be responsible for directly electing a prime minister, who will be the most powerful executive official in the country (although the directly elected president will retain certain powers). For the first time in Georgia’s independent history, whoever wins the parliamentary elections will determine executive power. Less important are alleged domestic and foreign policy differences between the United National Movement and the Georgian Dream. The ruling party has based its campaign in part on the claim that it is a progressive and modernizing force standing firm against a party of “dinosaurs” that wish to hurtle Georgia “back into the [Soviet] past.” The Georgian Dream says it is the true progressive and democratic force facing off against a statist authoritarian regime. While some differences have emerged, the race has not really been about platforms. The Georgian Dream is a coalition of disparate political forces: some more democratic and others more nationalist, some former United National Movement allies, and others former allies of the regime that came before it. No one really knows how different the Georgian Dream would be if it came to power. The main questions Georgians are asking are whether the current government has performed to expectations and should be trusted with another term in office, or whether it has discredited itself and another political force should have a chance. The main question for the United States should not be who wins but whether in the end the outcome is a democratic one that reflects the will of the Georgian population. One major problem with this narrative, however, is a lack of evidence. 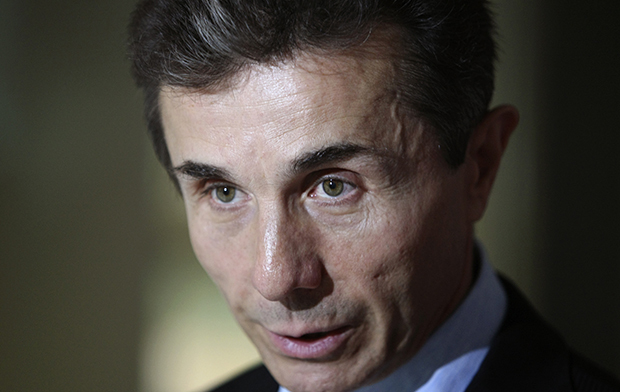 Ivanishvili made a fortune in Russia’s banking and mining sectors in the wild 1990s, a time when many businessmen with the right connections made a fortune by snapping up undervalued state assets. He goes out of his way not to criticize Putin or Russia while insisting that Georgia can both repair its relations with Moscow and adhere to a Euro-Atlantic orientation. He also insists that the Georgian Dream will be able to win over the separatist Abkhazians and South Ossetians who broke away from Georgia in the early 1990s and, since the August 2008 war, have taken shelter behind Russian occupying forces. Skeptics may call these positions “pro-Russian” at worst and naïve at best, but none of it provides a very good foundation for the government’s concrete—and possibly libelous—accusations of subversion and treason. Moreover, Georgian voters don’t appear to fully buy the government narrative. In an August 2012 public opinion survey commissioned by the U.S.-based National Democratic Institute and conducted by the Caucasus Research Resource Centers NGO, less than half of respondents agreed that Russia was “a real and existing threat to Georgia.” Another 30 percent said Russia was a threat but an “exaggerated” one. Across the last two rounds of the survey, about the same percentage of respondents said they trusted the Georgian Dream to manage relations with Russia as those who said they trusted the United National Movement (less than 25 percent). Leading an interagency delegation to assess the pre-election environment, Thomas O. Melia, U.S. deputy assistant secretary of state in the Bureau of Democracy, Human Rights, and Labor, recently said in Tbilisi that, “[n]otwithstanding a variety of shortcomings in recent months it is clear that there is a competitive campaign underway.” But what are these shortcomings? Overall, Georgia’s record on democracy-building is far from complete. Elections have yet to serve one of their basic functions—transferring power from one political party to another. Incumbent parties twice surrendered power in Georgia as the Soviet Union was collapsing from 1990 to 1991, first through elections, the second time through a short civil war. Since then, an incumbent has only lost power in the 2003 Rose Revolution that brought the United National Movement to power—but this happened through street protests, not the normal electoral process. For the past nine years, despite the government’s state-building accomplishments, the system has politically remained semidemocratic at best. It is characterized by an environment in which the ruling party has wielded a gamut of so-called administrative resources—the broad and frequently questionable use of government power for political purposes—to control or at least greatly influence election processes, the judicial and police systems, and the media. Relatedly, elections have not produced a vibrant multiparty democratic system, in which opposition political parties have enough of a presence in parliament to serve as a check on authorities or realistically position themselves as governments-in-waiting. Georgia still operates very much within the paradigm of a “party of power” rather than the modern democratic paradigm of parties that alternate power. Despite certain advances in election laws and the media environment, the current election campaign has reinforced this overall system. Ivanishvili’s emergence as the latest and most credible challenger to the ruling party prompted the government to take a host of new measures to secure its political advantages. Upon Ivanishvili’s entrance into politics, the government stripped him of his Georgian citizenship on a disputed technicality and refused to restore it, although in the end parliament passed a highly irregular constitutional amendment allowing him to participate in this election cycle. The government then took advantage of new campaign finance laws to go after Ivanishvili and his supporters. This led to levying multimillion-dollar fines against opposition leaders and parties, impounding tens of thousands of television satellite dishes owned by companies with links or sympathies to the opposition, freezing bank accounts, seizing assets, poring over the tax returns of lesser donors, and summoning rank-and-file supporters for questioning. Investigations and court cases were opened and closed at a rapid-fire pace; they often relied on questionable interpretations of law or were characterized by the absence of compelling evidence; and they meted out punishments that far outweighed the seriousness of the alleged crimes. Further giving the process a political shade, as Melia has pointed out, the former chair and deputy chair of the State Audit Commission—the body responsible for investigating campaign finance violations—are participating in elections as United National Movement candidates. All this has made for a highly disruptive and flawed election campaign. It has obscured what would otherwise be the natural tendency to scrutinize the ruling party’s own use of administrative resources. It has also amounted to equating a priori the opposition’s pursuit of power as a criminal act (on top of the accusations of Russian-led subversion). As a consequence, it has threatened to undermine the opposition’s ability to present itself to the population as a legitimate political force. How, then, can the race be competitive? For starters, the ruling party and the opposition are both actively campaigning; they both have full candidate slates; and they both are targeting voters with clear and contrasting messages, even if platform specifics are lacking. They both also receive media coverage, even if this coverage is polarized, and progovernment media dominates. The public opinion surveys commissioned by the National Democratic Institute have teased out a wide diversity of attitudes among the population on the state of the economy, democracy, and governance, and voting preferences overall appear to reflect this diversity. How close the race will be is almost impossible to tell. In addition to the National Democratic Institute surveys, three other surveys have attracted attention: one commissioned by the National Democratic Institute’s counterpart, the International Republican Institute; one commissioned by the United National Movement; and one commissioned by the Georgian Dream. According to the latest publicly available results across three of these polls, the United National Movement has an almost 2-to-1 or even 3-to-1 lead, with 37 percent to 46 percent of the vote compared to the Georgian Dream’s 12 percent to 24 percent. The Georgian Dream survey had its party narrowly ahead, at 42 percent to 41 percent. But opinion polls can be misleading in a number of ways. For one, the polls can hide the true preferences of voters. The number of respondents who didn’t know who they would vote for or refused to answer is high—from 19 percent to 20 percent in the International Republican Institute and United National Movement surveys, to an astonishing 43 percent in the National Democratic Institute survey in which the Georgian Dream polled only 12 percent (the Georgian Dream’s own survey was, again, an outlier, with a no-answer rate of only 9 percent). Depending on the kind of voting behavior that one assumes for those who abstained from stating their party preference, the result could end up anywhere from being a decisive majority victory for the ruling party to a neck-and-neck race. The final picture, however, may still be troubling for the Georgian Dream, as the polls only capture about half of the parliamentary seats. Majoritarian contests—in which the candidate that wins with more than 30 percent of the vote takes the seat—will decide 73 of the 150 parliamentary seats. While the Georgian Dream has nominated candidates in nearly every district, there is little basis for determining how many races the party is likely to win. Several other opposition (or quasi-opposition) parties have also put up candidates, diluting the antigovernment vote. The historical record in majoritarian races in Georgia, as in many post-Soviet semidemocracies, has not been kind to opposition parties—in the previous parliamentary elections of 2008, they won just four of 75 seats. The Georgian Dream needs to do much better in these races if the balance of power in parliament is to reflect its share of the popular vote. Meanwhile, the government’s efforts to delegitimize the opposition have not necessarily had their desired effect. In earlier National Democratic Institute surveys, a majority of respondents disapproved of the government stripping Ivanishvili of his citizenship. In their most recent poll, which gave the Georgian Dream 12 percent support, more than 40 percent of respondents expressed disapproval with the fines imposed on Ivanishvili and his coalition partners and the seizure of satellite dishes from affiliated media companies. Only around 15 percent approved of these actions, with less than one-third of even ruling party supporters supporting such actions. This suggests that for much of the population, the Georgian Dream has been a legitimate political choice all along—maybe not their choice, but a legitimate one nonetheless. Finally, and most dramatically, the prison abuse scandal last week gave the Georgian Dream a boost, although it is difficult to tell how large that boost is. The government responded swiftly and appropriately, arresting several prison officials and accepting the resignations of the minister of corrections and legal affairs and the minister of internal affairs. But the government is now on the defensive. The scandal has galvanized opposition supporters—the turnout at an opposition rally in western Georgia this past weekend was huge, followed by a sizeable student protest in Tbilisi on Monday. The outpouring of national criticism might also stifle some who were planning to vote for the ruling party or encourage those who were reluctant to cast their vote against the government—or who were undecided—to do so now. A lot of weight now rests on the conduct of government and opposition stakeholders on election day and the days that follow. The rise in antigovernment sentiment prompted by the prison abuse scandal has energized the opposition. In addition to setting its sights on victory, the Georgian Dream gives the impression of promising a day of reckoning—and not just for the government. At last weekend’s campaign rally in western Georgia, Ivanishvili called Saakashvili an “executioner,” insisting that “[t]hose who will even slightly justify the acts of these executioners will themselves be executioners.” Such rhetoric—of which there are other examples—is problematic. It pushes government officials into a corner, convincing them of the need to take an even harder line against the opposition rather than encouraging a freer electoral environment. It also raises the same questions about the Georgian Dream that have been asked about the government concerning its ability to respect democratic principles and the rule of law and to acknowledge the legitimacy of political adversaries. In the final days before the election, the government has also tried to cast doubt on the Georgian Dream’s credentials, leaking evidence it says ties Georgian Dream candidates to organized crime and proves its antidemocratic tendencies. In this climate, the future of Georgian democracy depends less on whether the United National Movement or Georgian Dream wins the election and more on the proper functioning of democratic institutions and the cultivation of an inclusive political culture. Domestic and international observers’ assessment of election day conduct and—as importantly—the complaints and appeals process looms large. This means not rushing to conclusions. U.S. and European governments should accept the preliminary assessment of election observers as just that—preliminary—and make clear they will reserve their final judgment as to the quality of the election until the process of investigating and resolving election day violations is complete, including as-needed recounts and revotes. Just as importantly, they should appeal to government and opposition leaders alike to reject a politics of retribution and exclusion—as well as any other attempts to degrade the electoral process—and to recognize that, whoever wins, the best outcome will be if the parties continue their confrontation across the parliamentary aisle. Georgia has already suffered too many swings from one dominant political actor to another. It is time to make room for more. Cory Welt is an Adjunct Fellow at the Center for American Progress and associate director of the Institute for European, Russian and Eurasian Studies at George Washington University’s Elliott School of International Affairs.